The Indian government’s decision to scrap the Indus Water Treaty (IWT) of 1960 unilaterally shocked Pakistan as it failed to build dams on rivers at the lower riparian. This unexpected Indian action came after the Uri attack on Indian soldiers in Kashmir. In fact, Modi’s government in New Delhi is taking every step to isolate and terrorize Pakistan in response to Islamabad’s recent diplomatic effort to highlight the Kashmir issue. India has also become furious on the construction of thousands of dams by China in the Tibet Plateau on the upstream of the Indo-Gangetic Plain. India publicly considers Chinese dams on the upstream end as a water weapon against it. Therefore, India’s current water diplomacy hints that India is trying to unite “downstream” Asian nations to force Beijing to sign a trans-border water sharing treaty to counter its massive damming policies. India’s act of revoking the IWT is part of this effort for diplomatic pressure on Beijing to be accelerated for a new water treaty in the region. Water control in an upstream area could be used as a double-edged weapon against downstream countries. The current geopolitical scenario in South Asia can easily describe how upstream countries are using this in human practice against downstream countries. As China is building dams on freshwater resources in Tibet, the same India is working on hundreds of hydropower projects and dams in Kashmir on Pakistani rivers. Unfortunately, India has the first control of all 6 Indus water rivers of Pakistan which provided strategic advantages to India against Pakistan just as Chinese control over Tibet plateau waters provided strategic advantages to Beijing against other Asian nations. Historically, for the first time after the birth of Pakistan, India used the water weapon by stopping the supply of water from every canal flowing from India to Pakistan on April 1st, 1948. After the continuous protest of Pakistan, India agreed on an interim agreement with Pakistan on May 4th, 1948, but a permanent solution came in September 1960 when both countries signed the agreement known as the Indus Water Treaty. According to this treaty, Pakistan gained exclusive rights to three western rivers, namely the Indus, Jhelum and Chenab, while India retained rights to the eastern rivers, namely the Ravi, Beas and Sutluj. 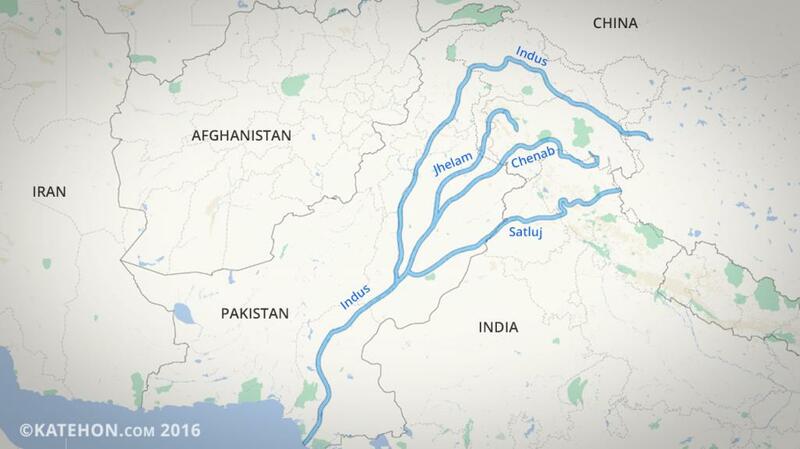 Unfortunately, India has not only built mega dams on Pakistani rivers such as the Indus, Chenab and Jhelum, but is also working to divert Pakistani rivers to India through massive tunnels. The first time that India publicly threatened to revoke IWT, it was India that practically breached the treaty through building disputed dams in occupied Kashmir on Pakistani rivers. In fact, India is working on a strategy to render Pakistan’s link-canal system redundant, destroy Pakistan’s agriculture, which is the country’s backbone, and turn Pakistan into a desert. India has no special rights to the Chenab River, but it has built 14 hydroelectric plants and is building more power projects which will enable it to block the entire water flow of Chenab for up to 20-25 days. This damming policy on the western river Chenab is an open violation of the treaty and provided strategic advantages to India against Pakistan, as these dams have provided India with the opportunity to use water as a weapon of mass destruction through releasing huge quantities of water downstream not only causing damage to standing crops, but also breaking canal systems. The Chenab River provides water to 21 canals and irrigates about 7 million acres of agricultural land in the Punjab province of Pakistan. Meanwhile, the Indian “Chutak” dam on the River Suru, (a major tributary of the Indus River in Indian-held Kashmir) has also become a direct threat to the Pakistani side of the Silk Road (Karakoram Highway also known as KKH). In the case of a dam collapse or deliberate release of a large quantity of water, the KKH between Basham and Jaglot would be washed out, which is also dangerous for the Pakistani-proposed Bhasha dam. This could also submerge the city of Skardu (a northern city of Pakistan) and its airport. Beside the Chenab and Jhelum rivers, India is also working on dams on the Indus River which can be described as a direct threat to Pakistan’s agriculture, because it is one of the longest rivers of the world which flows from Tibet Plateau and runs 400 km through China and about 300 km in Indian Ladakh and then enters into Pakistan with a total length of 3200 km. All rivers which flow in Pakistan meet with this mighty Indus river reaching its mouth in Arabian sea. A recent study entitled ‘Mountains of Concrete: Dam Building in the Himalayas’ warns that Pakistan is on the brink of a water disaster. There is the possibility that its water could plunge to 800 cubic meters per capita annually by 2020 from the current 1,200 cubic meters. Just 60 years ago, 5,000 cubic meters of water was available to every Pakistani citizen. Unlike India, Pakistan is highly dependent on agriculture and the Indus River’s unique irrigation system. Pakistan is 80% dependent on this irrigation. There is no doubt that agriculture is the mainstay of Pakistan's economy, as it accounts for 21% of GDP and, together with agro-based products, fetches 80% of the country’s total export earnings. More than 48% of the labour force is engaged in this sector. Therefore, being an agrarian country, Pakistan’s water issues with India are just as important as the UN’s resolutions on the Kashmir issue. In fact, these two are interlinked, as Kashmir is a lifeline for Pakistan. Hence why three wars between India and Pakistan have been fought over control of Kashmir and its water reservoirs. Pakistan has raised its voice against Indian damming policy on occupied Kashmir on Pakistan’s water. India has already constructed 50-60 medium-sized projects and it plans more than a hundred. This Indian policy shows that India wants to block every drop of Pakistan’s water. Pakistan's water issues with India are about just as important as the resolution of the Kashmir problem. In fact, the two are interlinked. Therefore, the resolution of the water issue should be part and parcel of any process of normalization between India and Pakistan. The Dul Hasti Hydroelectric Project, Salal Hydroelectric Project, Uri Hydroelectric Project - I & II, Kishanganga Hydropower project, Baglihar, Bursar, Kirthai, Sawalkot, Nimoo Bazgo, Dumkhar & Chutak dams and Wullar barrage are disputed dams and projects between Pakistan and India and they are all built on the western rivers to which Pakistan has exclusive rights. After India’s threat to revoke the water treaty, Pakistan should have also looked beyond IWT, because India has already violated it through building disputed dams on Pakistan’s water. The World Bank arbitration process should be reactivated to immediately stop the construction of disputed dams on the Indus, Chenab and Jhelum rivers. Like China, South Asian and East Asian countries are also facing water scarcity and all are dependent on Chinese control of the Tibet Plateau for freshwater. Tibet is the source of ten major Asian rivers upon which 25 percent of the world population depends. Therefore, it is known as Asia’s lifeline. But unfortunately, China’s massive damming policy in Tibet has become an open threat for severe water shortages in South Asia and Southeast Asia. Currently, China has 87000 dams and most of them are constructed in Tibet. What’s more, it has plans to build more dams and hydropower projects in the future to fulfill the needs of the country’s water-scare areas.Chinese dam building and water division plans along the Yarlung Zangbo, also known as the Brahmaputra in India, are a source of tension between China, India and Bangladesh. Despite the dams on South Asian Rivers, China is also working to build 21 more dams in addition to the 7 dams it has already built on the upper stream of the Mekong River (known as the Lancang in China) which is the main source of water for Southeast Asian nations. The Mekong crosses through Qinghai, Tibet, and Yunnan before flowing into Myanmar, Laos, Thailand, Cambodia, and Vietnam. Four riparian (downstream) countries, Laos, Cambodia, Vietnam and Thailand, had constituted the intergovernmental Mekong River Commission (MRC) to avoid conflict between Mekong basin countries through the promotion of sustainable management and water development for mutual benefit, while China has an observer status in MRC. China and the MRC directly dispute the construction of dams on the upper stream, but China has rejected all downstream concerns. However, due to diplomatic pressure by the Association of Southeast Asian Nations (ASEAN), China did agree to the Lancang-Mekong cooperation mechanism (LMCM) last year in November. International laws and conventions provide the first rights to water use to downstream countries on trans-border rivers, but unfortunately, China is the only country which does not adhere to this. Its damming policy has hinted that China is working only to fulfill its own national interests in facing severe water shortage challenges. One quarter of Chinese territory consists of deserts while, as a whole, it is an extremely arid country with the world’s largest population. But on other side, all Tibetan rivers which flow into South Asia and Southeast Asia have the most populated basins with mouths running into the South China Sea, the Bay of Bengal, and Arabian Sea. A Russian professor at Tomsk Polytechnic University and chief researcher of the Institute of Petroleum Geology and Geophysics, Stepan Svartsev, told TASS that water is a resource equal in value to oil, gas, and gold, and, sooner or later, we will start to sell it. We already sell it in stores and more and more people buy it. Water is becoming a commodity, and with time it will become more valuable than oil. We should be ready for this. It is also predicted that future wars will be fought over water and, unfortunately, all border disputes between the Asian nuclear triangular (China, India and Pakistan) are based on water control reservoirs. Now, as the world is tilting towards total war, the tension in South Asia has increased as Pakistan threatens India with nuclear war for blocking/diverting rivers which are directly linked with Kashmir. Moreover, Pakistan is already being subjected to Indian Hybrid War because it has given land access to China to reach the Arabian Sea, which is the mouth of Indus River. Indian efforts to counter China can easily be observed, as in its successful attempt to split up SAARC and bring the new cold war to South Asia. In fact, India is teaming up with South Asian and Southeast Asian countries against China by fueling water disputes. Hence why in South Asia, Bangladesh, who is totally dependent on Indian rivers, and Bhutan, who also has disputes with China, are supporting Indian diplomacy in isolating Pakistan, a move regionally aimed to counter China. Meanwhile, Pakistan, which is also fighting in the “Chinese war” in South Asia, has become the victim of the Indian water war against China. Chinese control over the roof of the world has given a unique, strategic position to Beijing to secure its water supply and future needs unilaterally. But in Pakistan’s case, the Indian threat to scrap the IWT unilaterally hints that India is going to adopt same of China’s water policies against Pakistan, as both have signed bilateral water sharing agreements for trans-border rivers. Unfortunately, Pakistan is living in a fool’s paradise if it really thinks India cannot annual and render the treaty void. In fact India has not only violated the treaty, but now it has continued to pursue its dream of making Pakistan docile in order to realize Indian ambitions. It is high time that China revisit its policy on Tibetan freshwater rivers upon which the populated Asian countries are dependent for their basic necessities and livelihoods. China still has not signed any multilateral treaties regarding shared tans-boundaries rivers, nor did it sign the 1997 UN Watercourses Convention that set the legal framework for rules and co-operation between more than 100 nations and their relevant international watercourses. On the one hand, China is working towards peaceful development and has created a “win-win” scenario for the revival of the ancient Silk Road through its proposed “Belt Road” initiative. But, on other side, it is going to block freshwater rivers which were part of ancient Silk Road. In other words, all Tibetan rivers are the branches of China’s Silk Road. Strategic control over Asian waters has also provided China with access to reach its maritime routes in the South China Sea, and Indian and Arabian oceans, which are the mouths of Tibetan rivers. Being the big brother of Asia, China should adopt a give-and-take policy and even help its friendly neighbor Pakistan through formulating multilateral or bilateral trans-border water co-operation rules and regulations, because Pakistan has become the victim of the same damming policy which the Chinese have launched in Tibet. A give-and-take policy could also help China clear its maritime routes involving the Bay of Bengal and South China Sea. In fact, the ball is in the Chinese court as it has appeared on the world stage as a leader of the multipolar world. But now, it is time to give up its selfish policy for the betterment of the multipolar nations of ASEAN and SAARC. If China can sign a shared water trans-border treaty with Russia for the Siberian Mighty Amur River’s water, then why can it not sign such treaty with Asian nations? It is true that every country in world must secure its own interests. But the massive damming policies of such Asian giants as China and India testifies to the fact that, sometimes, these individual interests must be sacrificed for the sake of mutual benefit and positive regional development. If China is interested in saving Asia from nuclear war, it must come to the table to solve water disputes in Asia. China has also become Pakistan’s last hope to save it from turning into a barren desert.